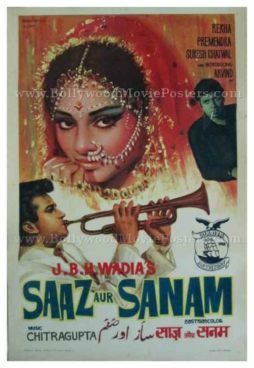 Old Bollywood poster for sale of the Hindi film Saaz Aur Sanam (1971). This is an actual surviving old Bollywood poster of the 1971 Hindi film that was directed by J.B.H. Wadia under his home production banner, Wadia Movietone. This old Bollywood poster for sale features stunning hand painted artwork. A large close up of actress Rekha in bridal wear is seen prominently on the center of the poster.